In celebration of Italian Heritage Month, RMU recently hosted historian, educator, and author of Italian culture, Sam Patti. Patti, the founder and operator of La Prima Espresso Company in Pittsburgh’s historic Strip District, has spoken around the country on the intricacies of the Italian culture. His presentation, “Italian American studies from 3rd generation and beyond,” focuses on how younger Italian Americans view their heritage and the traditions that were brought here and passed down by earlier generations. He said that early Italian immigrants, as well as those of other backgrounds, were influential in shaping the America that we know today. “Think about what it was like to be an immigrant in 1907… All they had was hope. But they also brought strength and opportunity with them. One of these young Italian Americans is Maria Satira, founder and president of RMU’s new Italian heritage club. Officially known as Voci Italiane, or “Italian Voices,” the new club will work to share the positive aspects of Italian heritage and serve as a resource for students of Italian decent and others who may be interested in Italian culture. Satira, a junior from Murrysville, Pa., with a double major in journalism and television production, said that she hopes this new organization will encourage RMU’s students of Italian heritage to develop a stronger connection to their family history and help preserve Italian tradition. “I decided to start the organization because I wanted to learn about my own culture through others’ experiences and traditions. I have a very big, very Italian family, and I want to expand that to my own Italian family at RMU. Voci Italiane already has many ideas in the works for the rest of the year, such as inviting speakers and poets, hosting a bocce tournament, volunteering at the Italian-American section of the Sen. John Heinz History Center, serving a spaghetti dinner at a homeless shelter, visiting the Strip District on an early Saturday morning, and bringing Italian lessons to the university. For more information, visit the RMU Multicultural Student Services page on Facebook.com. Richmond served as the Confederate capital and a main source of munitions, armament, and weapons, for the Southern armies. Here, the Tredegar Iron Works produced vital munitions during the war, including the 723 tons of armor plating that covered the ironclad C.S.S. Virginia. Union armies made several unsuccessful attempts to capture the city during the war before it finally fell to the Federals in April 1865. Five days after the fall of Richmond, Lee surrendered to Grant at Appomattox Courthouse. Today, the city still embraces its Confederate legacy, as exemplified by Monument Avenue, which features statues of J.E.B. Stuart, Robert E. Lee, Jefferson Davis, and Stonewall Jackson. It took the Union armies four years to make it to Richmond; we did it in 45 minutes. After filling up on a complimentary breakfast consisting mainly of an egg-like substance and coffee-flavored water, the RMU Civil War Study Tour participants and I loaded onto the bus and hit the road to Richmond – the one-time capital of the Confederate States of America. 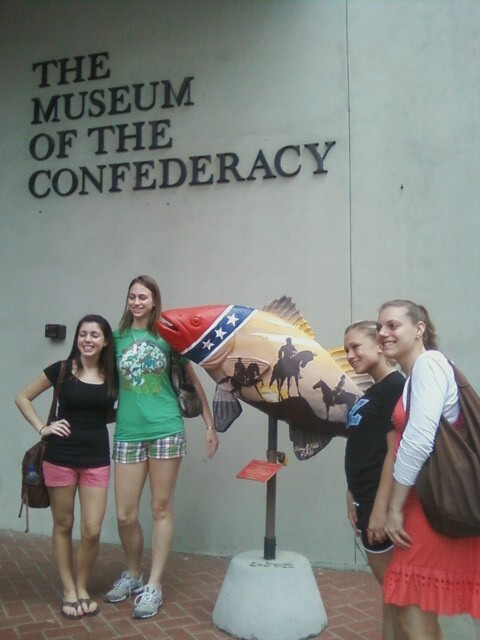 I started to understand this as soon as we arrived at The Museum of the Confederacy and I saw the big carp out in front painted with a mural of Confederate generals Lee, Jackson, and J.E.B. Stuart (see photo of RMU students around the Rebel fish). 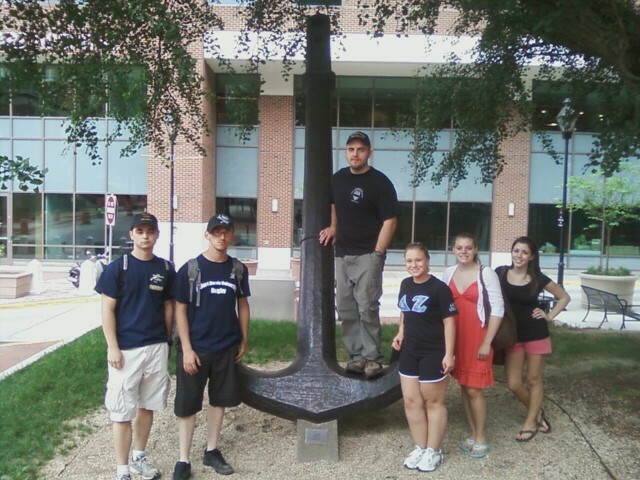 Also, in the same plaza, and somewhat more apropos, was the anchor from the C.S.S. Virginia, the legendary ironclad fought to a draw with the U.S.S. Monitor during the Battle of Hampton Roads in March 1862 (see photo). Once inside, we were free to tour the three floors of the museum, which featured hundreds of paintings, photos, and artifacts from the war, including some of the actual uniforms worn by Confederate soldiers. Brie, still wearing the same flip-flops she wore to climb Maryland Heights a day earlier, asked Civil War trivia questions to the other students as we viewed the displays. In the souvenir shop, Ashley, a freshman secondary education major from Republic, Pa., was surprised to find a miniature figure depicting a Zouave – soldiers who adopted the flamboyant, North African–inspired uniforms of the 19th century French infantry. And she would know. Last March, she took part in the “Military Through the Ages” event in Jamestown, Vir., as a reenactor with the 3rd Regular U.S. Infantry. The museum gift shop had everything a Confederacy enthusiast could ever want: Confederate Christmas stockings and ornaments, Confederate breath mints, and even “Johnny Reb Natural Beeswax Lip Balm,” mint julep flavor, which I just couldn’t pass up. 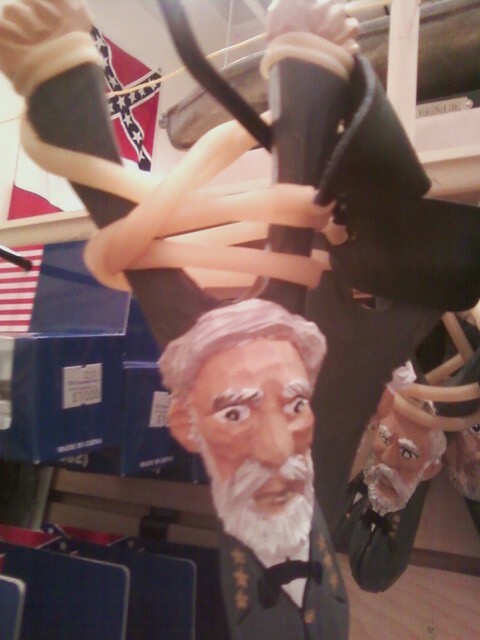 Dr. Barr bought a wooden slingshot carved in the likeness of Robert E. Lee (see photo). They even had a Bobby Lee nutcracker. 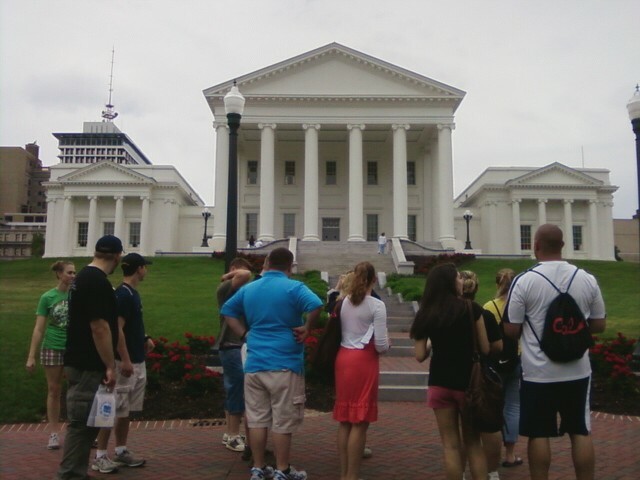 Next, we walked over the White House of the Confederacy, which sits right beside the museum. Built in 1818, it’s a beautiful, stately home with towering pillars on the back side. Jefferson Davis, his wife Varina, and their children moved into the house in August 1861 and remained there until the evacuation of Richmond on April 2, 1865. The house then became the U.S. Army’s headquarters and remained so until 1870. It first opened as a museum in 1896. Entering the house from the back, we were first brought into a small staging room in the basement with white brick walls, a brick floor, and two large photographs on the walls: one of Davis and one of his wife. There, our spirited tour guide for the day, Dean Knight, gave us a quick run-down of the tour and politely asked us to not take any photographs and not to touch anything. Minutes later, he politely reprimanded me after I temporarily forgot the rules and touched the wallpaper. After walking through the rest of the house, Knight took us outside for a walking tour of the town. 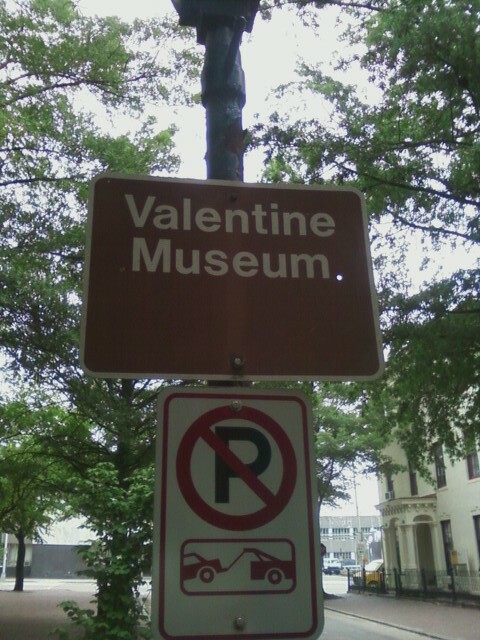 About a block up the street, we paused near the Valentine Richmond History Center (a wonderful name, in my opinion), which once held the eclectic collection of Mann S. Valentine, Jr., the independently wealthy creator of Valentine’s Meat Juice. Doesn’t that just sound yummy? Next, we strolled over to Capitol Square, where the 60-foot-tall George Washington equestrian monument stands near the Virginia State Capitol and the Virginia Governor’s mansion (see photo). “Washington’s my boy,” said Brian, a senior secondary ed. major from Bethel Park, with a particular interest in the Revolutionary War. “That’s my homedog,” he added. After admiring Brian’s “homedog” for a few minutes, we walked a short distance to St. Paul’s Episcopal Church, where both Lee and Davis attended services during the War. Davis was here attending services on April 2, 1865 when he received a telegram from Lee that the Union army had taken Petersburg and that Richmond would be next. He immediately left and headed over to his official office in the former U.S. Court of Appeals for the Fourth Circuit building, which overlooks the Virginia State Capitol (see photo). Elise believes so many Americans are still obsessed with the Civil War because of the major impact it had on our society. “It changed the history and structure of our entire country,” she said. Just then, the bartender brought over a bottle of (GASP!) Hunt’s Ketchup for Brian’s fries. “This is an outrage!” he said. “Man, that’s treason.” What else would you expect from a Pittsburgher? 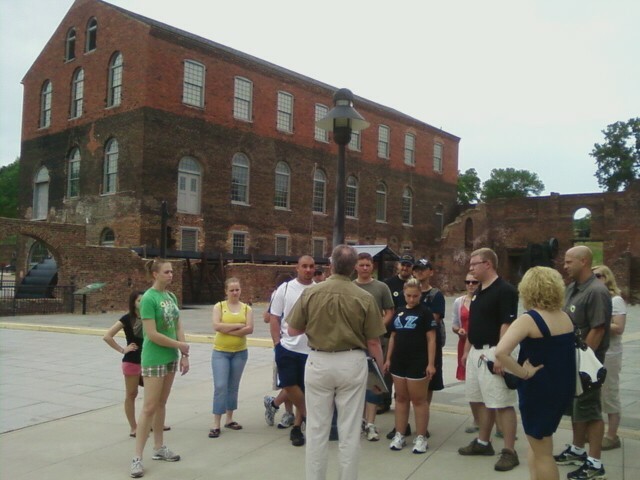 Following lunch, we walked about a mile or so over to the Tredegar Iron Works, the South’s main industrial center during the War, which today houses The American Civil War Center. Our guide was Mark Howell. Howell told us that, much like the foundries in Pittsburgh, Tredegar was built near the water to supply power and as a way to transport coal and other materials to the site. Also, before the start of the War, much of the coal used there to make iron was brought in from Western Pennsylvania for of its higher quality. After touring the museum, we loaded back into the bus and weaved through the back neighborhoods of Richmond to Hollywood Cemetery, the final resting place of over 18,000 Confederates, including President Jefferson Davis, Maj. Gen. George E. Pickett, and Gen. J. E. B. Stuart. The cemetery also holds the remains of Presidents James Monroe and John Tyler, three children of General James Longstreet, and approximately 2,000 casualties from the Battle of Gettysburg. 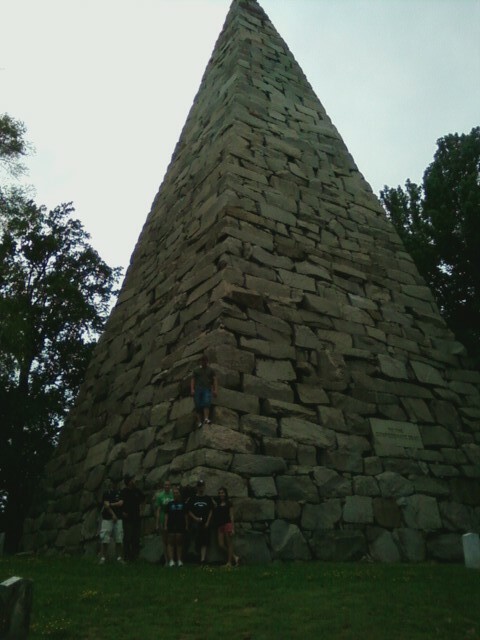 The most striking memorial in the cemetery, however, is the 90-foot, granite pyramid that, in 1869, became the first memorial in Richmond to the Confederate soldiers (see photo). An imposing structure, the pyramid was constructed entirely without mortar and sits on top of a mass grave that holds the bones of thousands of unknown Confederate dead. 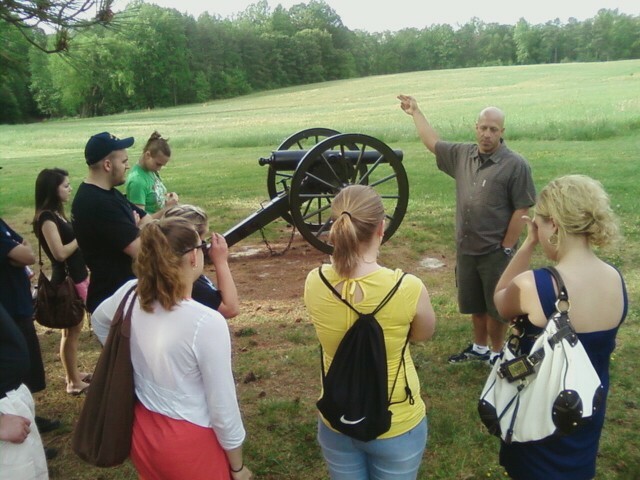 As we stood between two cannon overlooking the field, Dr. Barr went through the chronology of the battle to give the students a feel for where they were standing (see photo). Then we followed the park trail, which winded through the woods where most of the fighting took place. During the walk, students paused to read signs that pointed out the many still visible trenches where soldiers from both sides took refuge during the battle. It was a somber walk for many, who paused in silence to visualize the bloody, two-week battle that took place over this wooded landscape 146 years ago. Somma had just been named an honoree of RMU’s new chapter of the international honor society, which is exclusively for business students in AACSB accredited institutions. During the ceremony, which took place in RMU’s Massey Hall Theater, thirteen juniors and 14 seniors, along with 5 M.B.A. students, 3 M.S. in Nonprofit Management students, and 1 M.S. in Human Resource Management student, were inducted into the honor society, which represents the highest honor a business student can receive. Somma received his B. S. in Business Administration from RMU and now serves as president and CEO of Rande Somma & Associates, a consulting firm focusing on leadership coaching and development. Previously, he served as corporate officer for Johnson Controls, Inc. He is also the founder of the Rande and Georgia Somma Integrity First Scholarships, $2,500 awards given annually to the four RMU business students who write the best essays analyzing moral or ethical issues in a business case study. Somma said that the establishment of this new Beta Gamma Sigma chapter “speaks not only to the exceptional quality of the educational experience at RMU, but also to that of the extraordinary commitment to excellence embodied in the leadership of the university and the School of Business.” He also thanked the many people who had given of themselves to help him find success in life, and who had inspired him to, in turn, give back to others. Joseph DiAngelo, Ed.D., dean of the Erivan K. Haub School of Business at St. Joseph’s University in Philadelphia, awarded the charter to RMU’s School of Business and spoke of its impressive growth. “This is a school that is on the move,” said DiAngelo, “– in step with the goals of a great, student-centered university.” He added, “I know your faculty have been in the vanguard of this movement – this revival of great teaching – by embracing and actively promoting the most progressive trends in education today. “You are a part of the best that Pittsburgh has to offer,” he said. Robert Morris is a Yinzer! Robert Morris University’s official colors may be blue and white, but recently we’ve been basking in the Black & Gold of Pittsburgh! Yes, sir, it sure is a great time to be here in the Steel City, or should I say, the City of Champions. Things couldn’t be more exciting in Pittsburgh right now, and RMU is so glad to be a part of it. • On June 12, the Pittsburgh Penguins defeated the Detroit Red Wings by a score of 2-1 in the 7th game of the Stanley Cup Finals. This was great news not only for Pittsburgh in general but also for a big hockey school like RMU, whose men’s hockey and women’s hockey programs have also experienced a lot of growth and success in recent years. • Back in February, the Pittsburgh Steelers beat the Arizona Cardinals 27-23 in a thrilling Super Bowl XVIII, which like the Stanley Cup, came down to the final seconds. RMU even had connections working on the field for both sides during the big game. And Pittsburgh isn’t just getting recognized for its sports teams either. • In late May, the White House announced that Pittsburgh would be hosting the next G20 economic summit this September 24-25 at the David L. Lawrence Convention Center, which, by the way, is the only other conference facility in the city larger than our own Sewall Center here at RMU. • And just this week Pittsburgh was listed 18th on the Brookings Institution listing on the strength of local economies. Here at RMU, however, we don’t need anyone to tell us how great Pittsburgh is (although it is nice). We’ve always known what a vibrant, cultured, friendly city this is, and our students are lucky to be located in such an up-and-coming region. I wonder what our namesake Robert Morris would think of all this? You might think a guy like him —Founding Father, powdered wig, stockings, etc. — would be a little stuffy and not get caught up in all the excitment. I disagree. I bet he’d be swelling with Pittsburgh pride and eating a Primanti Bros. sandwich (capicola, cheese, and egg) while screaming “Let’s go Pens!” from the top of Mt. 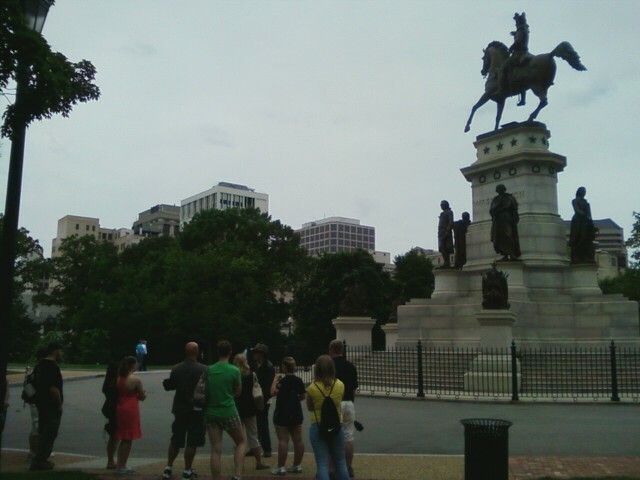 Washington (or, as they say in Pittsburghese, “Mt. WARSH-ington”). After all, that’s just the kind of guy he was. We’re here. What more do you need? p.s. — Not everyone is amused.